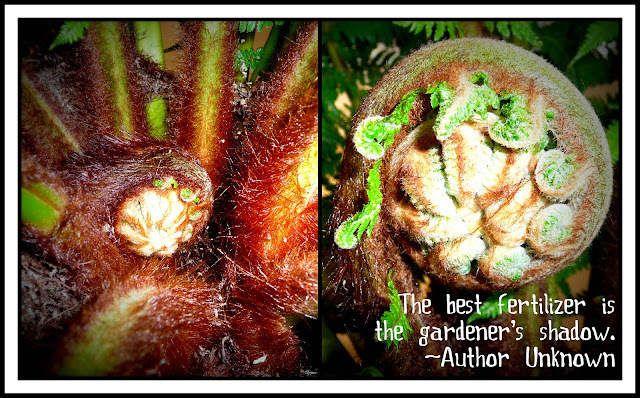 This is our Tree Fern blossoming fronds to its own season very quickly! to come up and they do arrive very quick as you never expected it. If you watch it every day, the fronds are growing so beautifully and happily! THE FRONDS ARE DELICIOUSLY LOOKING WHEN YOU HUNT THEM AS FOOD, I DID NOT MEANT THIS IS EDIBLE. NATIVE AMERICANS AND OTHER CULTURE IN THE WORLD EAT OR COOK THE FIDDLE-HEADS OF BRACKEN FERN AND OTHER SPECIES OF YOUNG FRONDS FERN. IT'S TEMPTING THOUGH ESPECIALLY WHEN THERE'S PLENTY OF FRONDS REACHING OUT. I REMEMBER WHEN I WAS YOUNG IN THE PHILIPPINES; MY PLAYMATES AT SCHOOL TAUGHT ME WHICH YOUNG FRONDS ARE EDIBLE, AND WE CALL IT "PAKO" or "PAK-PAKO" IN MY MOTHER'S TONGUE OR IN KANKANA-EY TRIBE DIALECT IN THE PROVINCE OF BENGUET PHILIPPINES. 1. Fiddleheads have about 35 calories per half cup and provide 20% of the daily recommendation for Vitamin A. 2. To avoid any bacterial food-borne illness, cook fiddleheads thoroughly. Ferns should be boiled for at least 10 minutes. Fiddlehead ferns have been linked to foodborne illness outbreaks. 3. Raw fiddleheads are bitter; cook thoroughly before eating to avoid a stomach upset. Tulip Haters in Ballarat, Why Would They Be?